Every year, Fiat-Chrysler asks teenagers to imagine what future vehicles should look like. 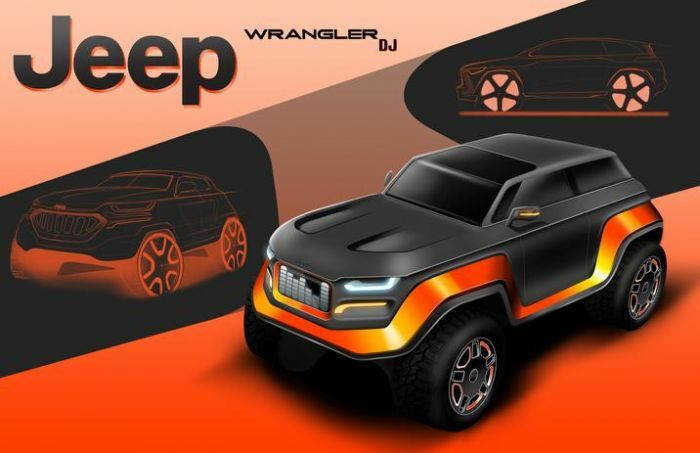 Three winners have been selected for their futuristic designs of the popular Jeep Wrangler. Now, the winning artists will have a chance to develop their skills with real-life auto designers. The overall winner of the FCA 2018 Drive for Design contest is Eduard Cret, from Design and Architecture Senior High in Miami, Florida. Cret’s design drives the Jeep Wrangler into the future with a new windshield-sunroof combination that lets the driver experience more of the great outdoors. The Jeep’s iconic lighting appears sleeker and the band of trim outlines the entire vehicle. The second place winner attends the very same high school in Florida. Emily Bryson from Design and Architecture Senior High, in Miami, imagines the 2030 Jeep Wrangler with what appears to be an entire roof made of glass. Notes on her sketches suggest that the glass be covered with insulating material for warmth and the pillars reinforcing the roof heat all four corners of the vehicle. The third place winner is Jinho So, who attends Canisius High School in Buffalo, New York. So’s sketches focus on a more streamlined Jeep Wrangler in 2030, with sleek curves. So’s sketches retain the large tires so that future Jeep Wrangler owners can continue their off-roading. FCA’s Product Design department sponsors the contest, along with EyesOn Design and Lawrence Technological University. The winning teenage designers will now get to experience a Day of Design with an exclusive behind-the-scenes tour of the FCA US Product Design studios and the opportunity to work one-on-one with professional automotive designers. They will also be treated to a two-week summer automotive design course at Lawrence Technological University, plus they will get to tour the EyesOn Design Automotive Design Exhibition. The contest is in its sixth year. It is open to students in grades 10-12. The winners will also receive tools to help them continue their design work. They will each get a Wacom MobileStudio Pro 16 – a full-featured, Intel®-powered computer that offers a larger space for drawing, detailed concept art, 3D sculpting and painting, motion graphics and advanced image editing for retouching. They also win an Apple iPad and Apple Pencil. The FCA US Product Design Office created its Drive for Design contest in 2013, as a way to educate young artists about careers in automotive design. It started in Detroit, but has grown into a national contest. Lawrence Technological University specializes in “Taking abstract ideas into the real world to solve tomorrow’s problems.” Henry and Edsel Ford reportedly helped launch the experiment that would become LTU, providing guidance and space in their sprawling former Model T assembly plant for the fledgling school. Lawrence Tech focuses on engineering, architecture, science and applied technology. Let us get to 2020 before we care what 2030 is gonna look like ok? And this Jeep Wrangler rendering shows a further proof that the voting age shouldn't be lowered. As long as Jeep keeps the Wrangler I don’t care what else they sell. This is a fun concept of a Jeep Wrangler, but you would never sell it to the standard Wrangler buyer. It might be cool as a performance line.